South Korea's jobless rate rose slightly in December from a year earlier, government data showed Wednesday, as the finance minister vowed to create 150,000 jobs this year. 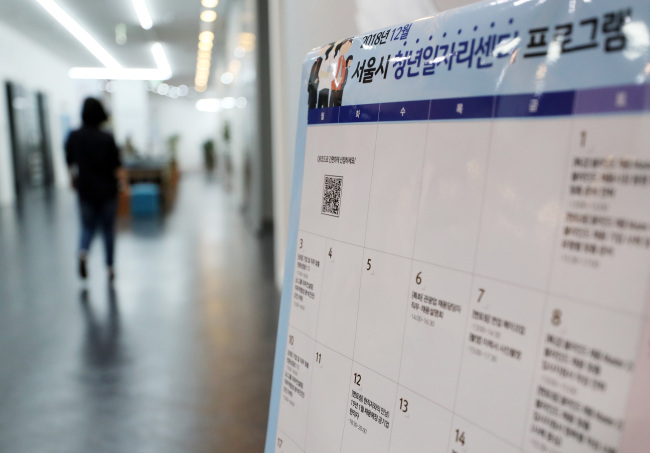 The unemployment rate stood at 3.4 percent last month, up 0.1 percentage point from a year earlier, according to the data compiled by Statistics Korea. The number of employed people reached 26.63 million in December, an increase of 34,000 from the same month in 2017, according to the latest findings. The unemployment rate for young adults -- those aged between 15 and 29 -- stood at 8.6 percent, down 0.6 percentage point from the previous year. The manufacturing sector lost 127,000 jobs in December compared with the previous year, and the retail sector also saw a reduction of 63,000 positions. 154,000 jobs, and the information and communication sectors saw an increase of 94,000 jobs last month. 2001 when the corresponding figure came to 4 percent. The number of employed people reached 26.82 million in 2018, an increase of 97,000 from 2017. This marked the smallest gain since 2009, when corresponding figures fell by 87,000 from a year earlier. The number of employed people stood at 26.82 million in 2018, up 0.4 percent from 26.72 million a year earlier, marking the smallest gain since 2009 when the corresponding figure fell 0.4 percent to 23.68 million, compared to 23.77 million a year ago. The slowdown in employment growth is mainly due to a decline in the economically active population and growth of the overall population as well as poor performance in the manufacturing and service sectors, said Bin Hyun-joon, head of the employment statistics division at the statistics agency. The statistics agency said the number of jobless people stood at 1.073 million in 2018, the largest since 2000. It marked the third straight year that the number of jobless people surpassed 1 million. Hong Nam-ki, the minister of economy and finance, said the government will place its top priority on revitalizing the economy, calling corporate investments a key to job creation. On Wednesday, Hong said he expects Hyundai Motor Group to begin construction of a 3.7 trillion-won ($3.3 billion) project to build a 105-story building in southern Seoul as early as before June.